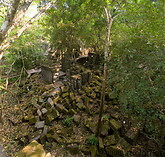 The Beng Mealea temple was built during the reign of King Suryavarman II in the early 12th century. It is essentially unrestored, with trees and thick vegetation growing among the towers and courtyards and stones lying in heaps. It lies 40km to the east of the Bayon. Beng Mealea is enclosed by a moat measuring 1200m x 900m.